I thought it would be nice to have a thread where we can post little thoughts about Tuxemon, and general ideas, and other creative stuff. So this is a thread for that. To give inspiration, each week I'll be posting a tuxemon that can - but doesn't have to be - the focus for the creative stuff. It makes its nest in long-burning fires, either of its own creation or in memorials, smithies and glassworks. Vivicinder is one of many creatures we got from the open source Catch Challenger game. It's an evolution of Vivipere, which is a snake that can evolve into many different forms. In the draft plot, you get a Vivipere egg and are asked to figure out an evolution for it. Each time you do, they'll give you another egg. Why can Vivipere evolve into so many creatures, and from all the elements? Is it more basic, or more advanced, than other tuxemon? Could there be a place where everyone gets a Vivipere, and which evolution it pursues determines that person's profession or caste? How do different evolutions of Vivipere interact with each other? Is there family love, or sibling rivalry, or hatred? What if a kingdom's Viviperes evolved differently each year, and this was how they marked their years. 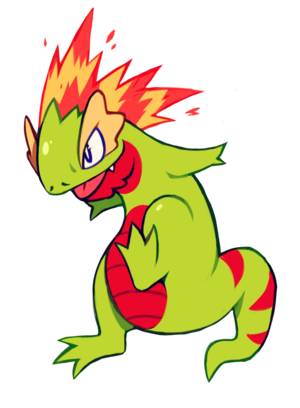 Perhaps the Year of the Vividactyl is a time of renewal and a restoration of authority, but if it is followed by the Year of the Vivicinder then you can expect that authority to fall into doubt and for turmoil to strike the region. On the first days of each year, a carefully prepared and high-level Vivipere would be observed by the Royal Soothsayers to see which evolution it takes. Then the Soothsayers would explain what the year can be expected to hold. Perhaps one year Vivipere stop following the rules, and evolve randomly. The Year of Chaos ... what does that mean for the kingdom? I'm interested to hear your thoughts and see your creations, either re Vivicinder, or just in general! Vivipere is probably a Tuxemon which was living on the planet a long time ago, like a prehistoric tuxemon or something similar, maybe it's not even a regular tuxemon but something else. It was probably living somewhere deep in the ground. With wars and the changes in climate, nature and others things, it probably got up (earthquakes, earthslides, cracks in the ground). While all others Tuxemon has developed already, this tuxemon is still the same as earlier - not really adapted to a fixed area or anything. Some of the Vivipere are suddenly in a desert, some may on a mountain in the cold, some may be in the water... to survive, it adapts to the environment quickly with the help of other tuxemon probably. Probably the different evolutions of vivipere are not interacting with each other that much. They might be so different, that they communicate differently and might not understand each other because of the different sounds they make.. but they might have similar gesture. They have different colors and all, but at their core, they are all snake-typeish. Thanks tamashihoshi, that's exactly the kind of thing I was thinking of. The Tuxemon of the Week for this week is Mystikapi. Probably my favourite tuxemon that doesn't have any sprites yet. It's based on the okapi, a relative of the giraffe. An okapi is the mascot of the Open Knowledge Foundation, so by coincidence Mystikapi could qualify as one of our mascot tuxemon! There's no blurb or title (the X tuxemon, like how Vivicinder is the Lit tuxemon) or anything else yet either, so let your imaginations run wild! It has been literally forever since I've popped by the forum, but it's good to see progress has been happening! I've gotta say I love Mystikapi, too! Grintot is one of the tuxemon that was created separately to the Tuxemon project, by Spalding004 for their Sitran region. Spalding's 'mons were a huge contribution to the project because they bolstered the number of 'mons with sprites that we had. 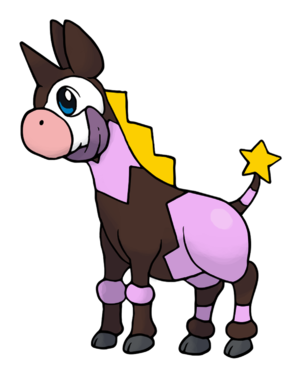 Grintot has two evolutions, Grinflare and Grintrock. This helped develop what is now a key idea: that some tuxemon have a forked, temporary evolution activated by pricey Badges. This plays into overarching themes in Tuxemon about walled gardens, vendor lock in, etc. I don't have much more to say about Grintot than that. I think it's a cute 'mon. I think he's cute too! When threatened it retreats into its shell and cools down dramatically by venting steam. It could be mistaken for a rock. Ignibus - called Magmaturtle for a large part of its development - was created by Cavalcadeur, who ended up re-spriting it. Then Leo took the idea and did new concept art, and then made their own sprite - which is the one we currently use. I was playing around with variants, and decided to create a Water variant for Ignibus. I had designs for an evolution as well but I never got around to making it. Like Grintot from last week, Ignibus is a split evolution triggered by Badges. Ignibus has in common with Rockitten its ability to disguise itself as a rock. Now I mention it, Grintot could probably do the same thing! I have a soft spot for Mk01 Proto because it coincidentally fits into the Spyder in the Cathedral plot really well! The plot has killer robots being fused with ancient dragons as part of an evil corporate scheme - and Mk01 Proto and its evolutions are robot-dragons! I also really like that Proto's final evolutions seem to suggest a detailed back story, although as far as I know one has never been given. What makes Gamma, Delta and Omega the way they are? It is playful, but must be taught early on to keep its fire in check. Agnite is a great example of collaborative design. The initial, realistic design was by Leo. I'm no artist, but I had a crack at cartoonifying it. I think Agnite is a really solid starter monster. It's a simple but attractive premise, and the colouration is very striking. There's also a sub-plot lurking in its descriptions: the way that Agnigon is a "false dragon", mistaken for the true dragons that are almost extinct. There's a few allusions to this extinction of the dragons in other 'pedia entries. 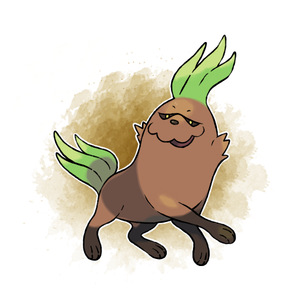 Of the five starters, I see Agnite as the mischievious and childish one. Rockitten I think of as childish but in a more innocent way. Tweesher is sharp and aloof. Lambert is shy and solitary. Nut is alien, but eager to please. What I love about the Tuxemon of the Week, Poinchin, is that it turns from an inoffensive, cute, innocent baby into a terrifying - although still absurd - monster. 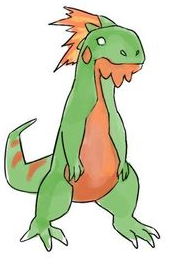 That seems like a classic Pokemon evolution - look at Tyrannitar, for example! What I love about the Hoarse family is how quickly they go from innocuous - "oh, a horse with a green mane" - to terrifying - "a spider ... possibly with more legs than a regular spider!". That the final form has the amazingly punny name "Hoarseshoo" certainly helps cement my affection for this family. Monster designer Rsg167 contributed a few designs, but doesn't seem to have participated for a while. Nothing much to say about this week's tuxemon because there's not much information about it! I kind of like that ... it just exists mysteriously instead of having some deep design purpose or clever reference. I imagine Necromanders being a bit like Jawas - inscrutable, but seeming to have their own inner lives and purposes. I bought this line off DarkySG because I was so charmed by their dorky, eager expressions. I imagine Turnippers being one of the options for the monsters bestowed upon new recruits into the Tuxemon Rangers. You could even write a story about a young Scout desperately hoping to be issued a cool Agnite or Cheezap. He spurns his Turnipper and runs into the forest, only to be set upon by poachers. Fortunately a tendril snakes out from the ground, and trips the poachers up - it's his loyal Turnipper, which he learns never again to take for granted. Skwib's placid, self-satisfied expression delights me. It evolves into Octabode, which occupies a shattered urn that must have ended up on the bottom of the ocean after a shipwreck.